Click here. Tickets cost £25, and you can buy as many as you want. We’ll pick the winner out of a hat at our Glasgow Long-Distance Ladies event on the 18th October, and we’ll broadcast the draw live on Facebook (and contact the winner by email, just in case they aren't watching). Of course. Please fill in their name and email address when prompted. If your entry is selected, they will be announced as the winner, and we will put them in touch with Shand by email so that they can claim their prize. We hope to raise a minimum of £1,500 through the auction. £1,000 of this will go towards the scholarship award; the other £500 will cover our admin time and any administrative costs Shand incur in preparing the frame and posting it to the raffle winner. What if you make more than expected? There’s a chance this might happen. After all, last year’s crowdfunder made us £6,000 more than we’d asked for. If we make significantly more than £1,500, we’ll consider making two awards; otherwise, the money will be put towards The Adventure Syndicate’s social aims, and used to fund school visits and young people’s bikepacking courses, and subsidise places on our riding weekends. I don’t want to enter the raffle. Can I make a separate donation? Yes please! Click here to donate. We are very grateful you want to support our work. We welcome entries from anyone who self-defines as a woman, and encourage you to apply no matter what stage of your life or long-distance cycling career you are at. Entries will open in late October, after the fundraising phase is over (and assuming we raise enough cash). If you would like to register for updates, or ask any questions that aren't covered here, please email hello@theadventuresyndicate.com. 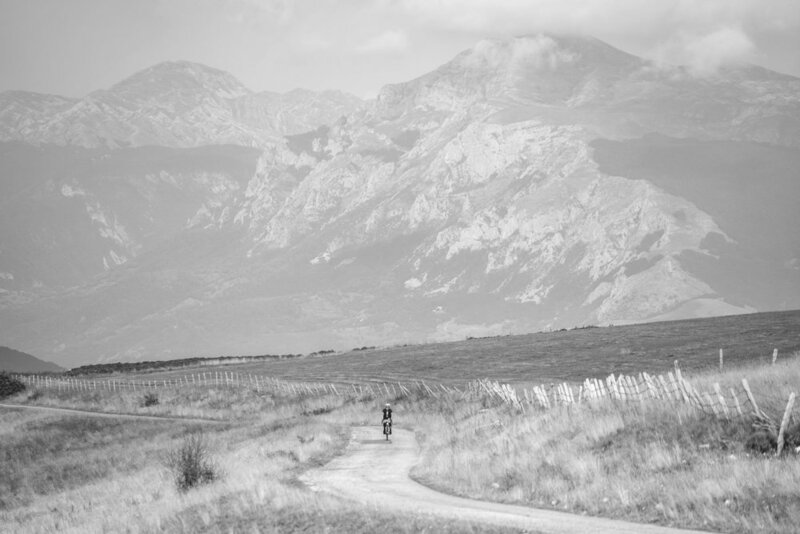 You can apply for this scholarship to cover any multi-day, self-supported event, be it a race like the Tour Divide or a non-competitive ride like the Torino-Nice Rally. The event must start before 31st December 2018. There are numerous overlapping definitions of ‘self-supported’, and where the lines are drawn is a subject we suspect will be eternally under discussion. You will find some examples of rules (and discussion) in the links below, and we recommend that as well as familiarising yourself with the rules of your particular event, you give some thought to where your own boundaries lie, as two riders may have different (and equally legitimate) interpretations of the same rule. We are also willing to consider applicants with a self-defined challenge, such as an attempt on the round-the-world speed record, or similar, as long as they adhere to principles of self-support. We don’t know how many applications we will receive, but the application process is designed to benefit all applicants, in that it will make a substantial contribution to their planning, and help them identify their strengths and weaknesses well in advance of their chosen event. We hope that, as a result of applying, you will be more likely to make it to the start line, even if you don’t win the scholarship. Do I need to have a place on my chosen event already? If the application deadline for the event has passed, then yes, you do. Will this be an annual thing? We don’t know yet. If it works well this year, and we find a sustainable way of funding it, then it might. For now, it’s an experiment. Are there other sources of funding I can apply to? Does my project have to focus on women riding long distances? No. If your best chance of making a difference is teaching six-year-olds to ride bikes, or helping people with mental health difficulties get out of the house, we can’t think of a better way to spend your time and energy. The most important thing is that you’re able to share this opportunity with as many other people as possible. The work of The Adventure Syndicate focuses primarily on women and girls, who are currently under-represented in sport and adventure, and face significant barriers when it comes to participating in physical activity. We believe not only in inspiring, encouraging and enabling women to push their boundaries, but also that each woman can become a role model for others, helping them to realize their own potential. Furthermore, women are distinctly under-represented in endurance sports, despite this being an area where female athletes are even more likely to flourish. We have identified financial scarcity as one of the main factors in women’s reduced participation, and since women statistically earn less than men, we felt this was a valid step towards equality. We have found that long-distance self-supported events embody many of the Syndicate’s core values, especially that of self-reliance, and found from our own experience and that of women we have already worked with that participating in such an event can significantly increase self-belief, ambition, courage and happiness, affecting a woman’s life far beyond the event itself. We recognise that not all women are inclined to enter long-distance races, and The Adventure Syndicate caters to a wide range of abilities and ambitions with its other activities.